I'm looking at 459 Leetonia Dr on www.realestateone.com.com and would like some more information. STUNNING, CUSTOM TROY HOME IN EXCELLENT LOCATION CLOSE TO MAJOR HIGHWAYS & SHOPPING AREAS. THIS HOME SITS ON AN EXCELLENT LOT WITH NEW & MATURE LANDSCAPING, SIDE ENTRANCE GARAGE, SECOND FLOOR BALCONY & HUGE WRAP AROUND PORCH. INSIDE THE HOME, ENTER INTO THE GREATROOM WITH DRAMATIC VAULTED, WOOD-LINED CEILING, TWO STORY BRICK GAS FIREPLACE & SEVERAL WINDOWS FOR AMPLE NATURAL LIGHT. JUST OFF THE GREATROOM IS THE KITCHEN FEATURING HARDWOOD FLOORS, GRANITE COUNTER TOPS, STAINLESS APPLIANCES AND LARGE BREAKFAST NOOK WITH BAY WINDOW. A SPACIOUS FLORIDA ROOM SITS OFF THE MAIN FLOOR WITH PLENTY OF EXTRA ROOM FOR ENTERTAINING. A FULL BATH & LARGE LAUNDRY ROOM FINISH OFF THE ENTRY LEVEL. UPSTAIRS, THE MASTER SUITE BOASTS UNIQUE, VAULTED CEILING, WINDOW OPENING OVERLOOKING THE GREATROOM & ATTACHED BATH WITH SEPARATE TUB & SHOWER. TWO ADDITIONAL BEDROOMS FINISH OFF THE UPPER LEVEL. DO NOT MISS OUT ON THIS AMAZING, CUSTOM HOME! Our Michigan real estate agents can answer all of your questions about 459 Leetonia Dr, Troy MI 48085. 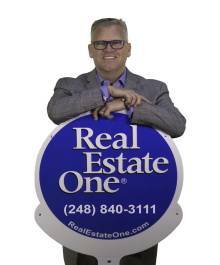 Real Estate One, Max Broock Realtors, and J&J Realtors are part of the Real Estate One Family of Companies and dominate the Troy, Michigan real estate market. To sell or buy a home in Troy, Michigan, contact our real estate agents as we know the Troy, Michigan real estate market better than anyone with over 100 years of experience in Troy, Michigan real estate for sale.